A man has been rescued from his car after it became wedged in a pedestrian-only walkway to a pier in the Republic of Ireland. 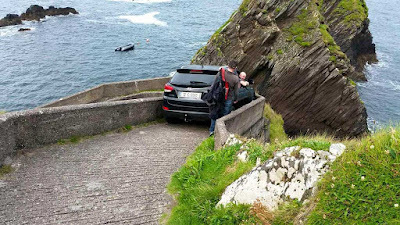 The car got stuck at Dunquin in County Kerry. It is believed the man got stuck on Tuesday night and spent more than 12 hours in the car until a ferry crew came across him on Wednesday morning. He was helped from the car by police before it was removed at about 12:00pm. 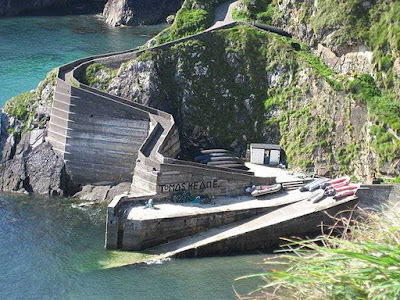 The pier is used for transporting people to and from the Blasket Islands, off the County Kerry coast. Sibéal Ní Lubhaing, of Blasket Island Ferries, said staff had "never seen anyone drive that far down" the narrow and windy path. "We were actually in awe of him, because there are couple of very sharp turns that you'd think a car could not navigate," she said. "There's also huge signs saying 'don't drive' going down to the pier." She said it appeared the man was in shock when staff eventually found him. "We're not sure, but it seems like he was there from about ten o'clock on Tuesday," she said. "After he got stuck, he didn't ring anyone for help although he had a mobile phone. When the crews found him, he was reluctant to leave the car. I think the shock hit him and he wanted to stay in the vehicle. "But, when he saw the police uniforms, he seemed more reassured and we were able to get him out through the boot. It was fairly innocent, everyone makes mistakes. Because it's our busy season there was a lot of people here this morning who saw what happened. But, the main thing now is that he's safe. We're happy he's okay." Irish police confirmed that they attended the scene and helped the motorist.